Do you often find your mind wandering during the day? Can’t remember where you placed your keys? Is it hard to concentrate on specific tasks? If so, it might be a good idea to try out some brain games! Brain games challenge your mind with fun, short games that train your memory, focus and cognitive function. For instance, a game challenging you to remember the placement of specific tiles on a board is an excellent memory workout. Word games can help improve literacy and focus. Brain games work because our brains have an inherent ability to change themselves by remodeling nerve cell connections after experience (this ability is known as neuroplasticity). With each game, your mind improves itself, and in the long run brain games has shown to markedly improve overall brain function. In adults, brain training games have been shown to workout existing gray matter, and help stave off memory loss and dementia that comes with age. 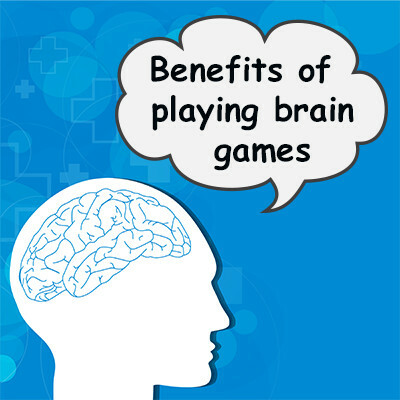 These games have also been shown to boost the dendrites in your brain that are responsible for processing information. So if you are concerned with maintaining your memory and focus with age, brain games are an excellent tool to help. For kids, the benefits of brain training may be even greater, helping improve child literacy, numeracy and even IQ. Kids who use brain games have been demonstrated marked academic performance as well – going from the bottom of their class to the top, all by exercising their mind just a few extra minutes a day. The best part about working out your mind with brain games is – it’s super easy! Typically, brain games are really short, just a few minutes a piece, making it easy to get a brain-busting workout in at least once a day. Play some as you get ready in the morning, or give your kids some gaming time after school! Early brain game studies have shown that 20 minutes of brain games 3 times a week helps stimulate the mind, lengthen attention spans and improve memory recall abilities. hanks to smartphone, it’s easy to get some brain training done on the go! Playing on the bus, while waiting for a meeting or just when you have a few extra minutes will really add up over time. A really great app is Super Brain Game, which offers 99 levels of memory training that works well for both kids and adults. It also allows you to track and share your progress, so you can see your own improvements and challenge your friends! Anyone who uses brain training games or exercises will find that in the long run, their mind will work faster, better and more efficiently. Plus, it’s so easy – why not give it a try!